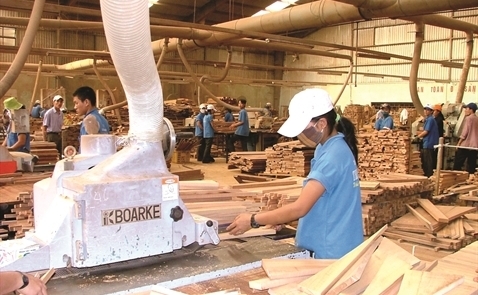 VietNamNet Bridge - More Chinese businesses have set up wooden furniture processing factories in Vietnam order to take advantage of preferential tariffs importers are offering to Vietnamese exports. The decision by the Chinese government to close natural forests throughout the Chinese territory by 2017 has prompted Chinese wooden furniture enterprises to look for new timber material sources. Vietnam is one of the favored destinations. Of the 500 foreign-invested wooden furniture enterprises now operating in Vietnam, one-third are from China and Taiwan. Binh Duong Province attracts most of the capital, with 29 out of 100 newly invested factories by mid-2016 belonging to Chinese and Taiwanese enterprises with initial investment capital of $82.4 million. There are a total of 900 enterprises in the country from China and Taiwan, capitalized at $5.5 billion. More Chinese businesses have set up wooden furniture processing factories in Vietnam order to take advantage of preferential tariffs importers are offering to Vietnamese exports. “In recent years, many Chinese enterprises have been quietly relocating their factories to Vietnam under many different ways,” said Nguyen Ton Quyen, secretary general of Vifores. Vietnam can provide timber materials, while exports from Vietnam to the EU and US are taxed at only 0-4 percent. Huynh Van Hanh, deputy chair of Hawa, said that many Chinese buy Vietnamese unprofitable or bankrupt businesses and run businesses under Vietnamese names. He said about 30 new Chinese investors wanted to set up business because of preferences offered for exports from Vietnam. This has hurt Vietnamese enterprises. Luu Phuoc Loc, director of Mtrade in Binh Duong province, noted that many Chinese had registered investments in Binh Duong province, but had not organized production in Binh Duong. They bring ready-made products to Vietnam, where they just assemble, paint the products and export. This allows them to get the Vietnamese C/O and enjoy preferential tariffs. “Chinese businessmen now cannot get C/O to export to the US as they have been accused of dumping in the market,” he explained. Every year, Chinese export $12 billion worth of wooden furniture products to the US, while Vietnam exports $2 billion only. A report from the Forestry General Directorate showed that Vietnam’s timber and wooden furniture exports in 2016 were estimated at $7.3 billion. Though there was no official figure, the directorate said that many Vietnamese businesses had lost orders to Chinese. According to Vifores, foreign invested enterprises (FIEs) have made the greatest contribution to the growth of the wooden furniture industry. In the past, 65 percent of wooden furniture exporters were Vietnamese enterprises, but the figure is now 30-35 percent. Besides loyal markets, Vietnamese exporters are now eyeing new potential markets such as South Korea, the Middle East, India and Russia. Exports to South Korea increased sharply by 17.5 percent in the first 10 months of 2016.